Auto Restart your Computer with Force (Brute) or Normal Restart easily after Configuring Several Minutes with Turn Off Monitor Software Utility. You can Configure your Computer to Restart your Computer to Restart after Several Minutes Configuring in Turn Off Monitor Application. For e.g. If you want to Restart your Computer every after 60Minutes (1 Hour) you can Configure in the Turn Off Monitor Settings to Restart your Computer every after 60 Minutes. Download & Install Turn Off Monitor on your Computer. Launch Turn Off Monitor Settings from Desktop Shortcut. 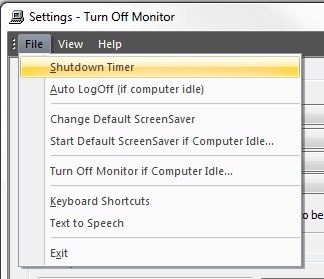 Go to File of Turn Off Monitor Settings Window and Select ShutDown Timer another Window will appear called ShutDown Timer. 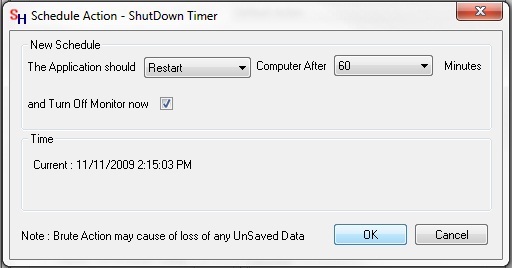 In Shut Down Timer window Select Restart or Restart (Brute) in The Application Should option. After Selecting the Restart option Configure Minutes in the Computer After option for eg I am Configuring 60 Minutes to Restart my Computer every after 1 Hour as displayed in Screen Shot. After Configuring the Minutes you can Mark on the below option to Turn Off Monitor now option i.e. if you mark in Turn Off Monitor now your Computer Screen will Switch Off after pressing OK so to disable to Turn Off your Computer Monitor Screen you should Unmark, by default the and Turn Off Monitor now will be Marked. After that press OK to Save Changes. And now your Computer will Restart or Restart with Brute as you have Configured every after 60 Minutes or as you have Minutes Configured. If you Select Restart (Brute) your Unsaved Documents will not Save and it will Force the Computer to Restart.